Choose a topic to view the recommended websites for this book. Watch a fun song about Julius Caesar. Examine a Roman coin showing the head of Augustus. Watch a video about how to become a gladiator. More about the Colosseum and the bloodthirsty "Games" held there. Find out about children's games, chariot races and other entertainments, and what people ate. See how to put on a Roman toga. What was it like to live in an apartment or a house in ancient Rome? How to make a Roman shield. 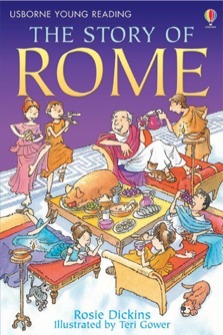 The story of the Roman Empire, retold as a story for children growing in reading confidence. Re-tells the history of Rome, from the myth of Romulus and Remus to the foundations of the vast Empire and the Emperors who ruled it and its eventual collapse. Colourfully illustrated by Teri Gower. Usborne Young Reading has been developed with reading experts from Roehampton University.